The work reveals the ways that the Christian broadcast community affects evangelical traditions and influences American society in general. 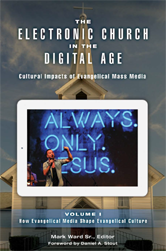 It explores how electronic media shapes today's Christian subculture, while the second volume describes how the electronic church impacts the wider American culture, analyzing what key figures in evangelical mass media are saying about today's religious, political, economic, and social issues. The set concludes by addressing criticism about religious media and the prospects of American public discourse to accomodate both secular and religious voices. Introduction by Mark Ward Sr.
Chapter Nine: In Spirit or in Truth? The Great Evangelical Divide, from Analog to Digital - Mark Ward Sr.
Chapter One: What If? A Counterfactual Reconsideration of the Electronic Church - Mark Ward Sr.